This article is about the 1960 film. 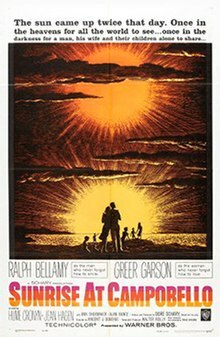 For the 1958 play, see Sunrise at Campobello (play). The film was produced with the cooperation of the Roosevelt family. Eleanor Roosevelt was present on the set during location shooting at the Roosevelt estate in Hyde Park, New York. The film begins at the Roosevelt family's summer home on Campobello Island, New Brunswick, Canada (on the border with Maine), in the summer of 1921. Franklin D. Roosevelt is depicted in early scenes as vigorously athletic, enjoying games with his children and sailing his boat. He is suddenly stricken with fever and then paralysis. Subsequent scenes focus on the ensuing conflict in the following weeks between the bedridden FDR, his wife Eleanor, his mother Sara, and his close political adviser Louis Howe over FDR's future. A later scene portrays FDR literally dragging himself up the stairs as, through grit and determination, he painfully strives to overcome his physical limitations and not remain an invalid. In the final triumphant scene, FDR is shown re-entering public life as he walks to the speaker's rostrum at a party convention, aided by heavy leg braces and crutches after his eldest son James pushed his father's wheelchair near to the podium. Robin Warga – Franklin Roosevelt, Jr.
Sunrise at Campobello presents events that took place over four years, from August 1921 to July 1924, culminating in FDR's speech at the 1924 Democratic National Convention. Before and during Franklin D. Roosevelt's presidency, the extent of his disability was minimized. Sunrise at Campobello depicts the debilitating effects of FDR's paralytic illness to a greater extent than had been previously disclosed by the media. FDR was diagnosed with polio in 1921, but his symptoms are more consistent with Guillain–Barré syndrome - an autoimmune neuropathy which his doctors failed to consider as a diagnostic possibility. In any case, the film is accurate in the sense that FDR and everyone around him believed that his symptoms were caused by polio. Greer Garson won the Golden Globe Award for Best Actress - Motion Picture Drama. The film was also entered into the 2nd Moscow International Film Festival. ^ "Sunrise at Campobello". AFI Catalog of Feature Films. American Film Institute. Retrieved 2015-09-26. ^ "NY Times: Sunrise at Campobello". NY Times. Retrieved 2008-12-24. ^ "Oscars.org -- Sunrise at Campobello" Archived 2014-01-14 at Archive.today. Academy of Motion Picture Arts and Sciences. Retrieved January 15, 2014. Wikimedia Commons has media related to Sunrise at Campobello. This page was last edited on 9 November 2018, at 10:36 (UTC).